How long have you been working at Royal Holloway? 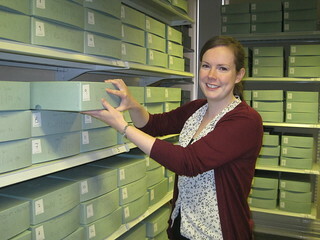 I took over from the previous College Archivist in January 2012 so I’ve been here just under two years. Tell us a little about your role. When I tell people I’m an Archivist the most common reaction is a blank look (although I have been mistaken for an Alchemist on more than one occasion), in the most basic terms I look after the historical records of the College but that description doesn’t really do the job justice. We hold collections from Bedford and Royal Holloway Colleges and from the merged College as well as special collections which include theatre archive material and collections of rare books. My work is really varied, some days I’ll be in the stores checking our pest traps for any unwanted insects or going through new material to sort, list and then catalogue it so it can be used by researchers. Other days are spent answering enquiries about our collections and supervising researchers who have come in to consult the material. I also promote the collections in a number of ways including writing our Archive Item of the Month feature, putting on exhibitions and events, giving talks on the collections and history of the College and running student sessions about using archives. Preservation of the collections is another important part of the job and I am currently working with other staff to find ways to preserve digital records as well as the more traditional paper material. Helping people make connections with history through our collections – whether that is a theatre student in awe that she is holding a letter written by Ellen Terry, being told that your email has made someone’s year because the information in a student record has filled gaps in their family history or hearing current students discussing the similarities between Victorian student rooms and their own. The archives contain such a wealth of information and I’m here to help people discover it. The variety! No two days are the same and I’m constantly learning new things about the Colleges’ histories from the collections and also from people I meet who tell me about their research or their own experiences at the Colleges.